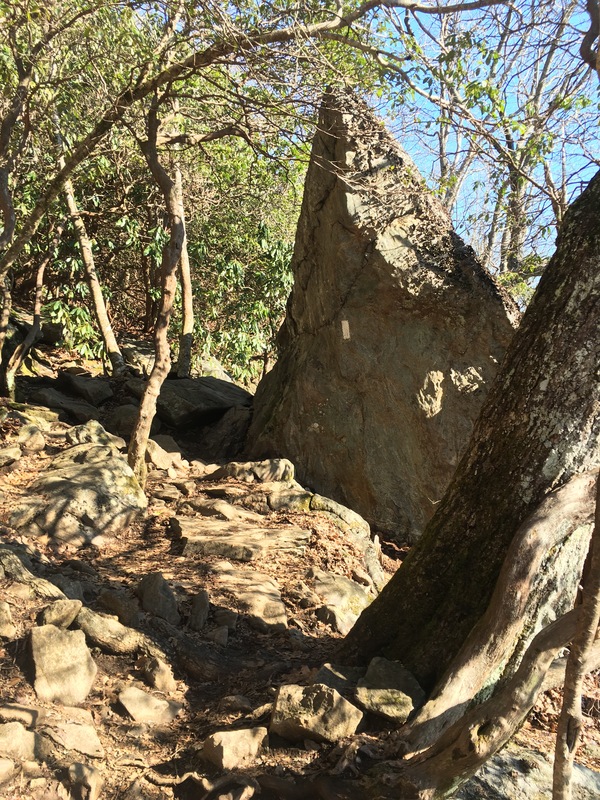 Hiking the Appalachian Trail is, without a doubt, a huge physical and mental challenge. The 2,190 miles of the trail undergo a total gain and loss of elevation of 464,500 feet – the equivalent of climbing Mount Everest 16 times. 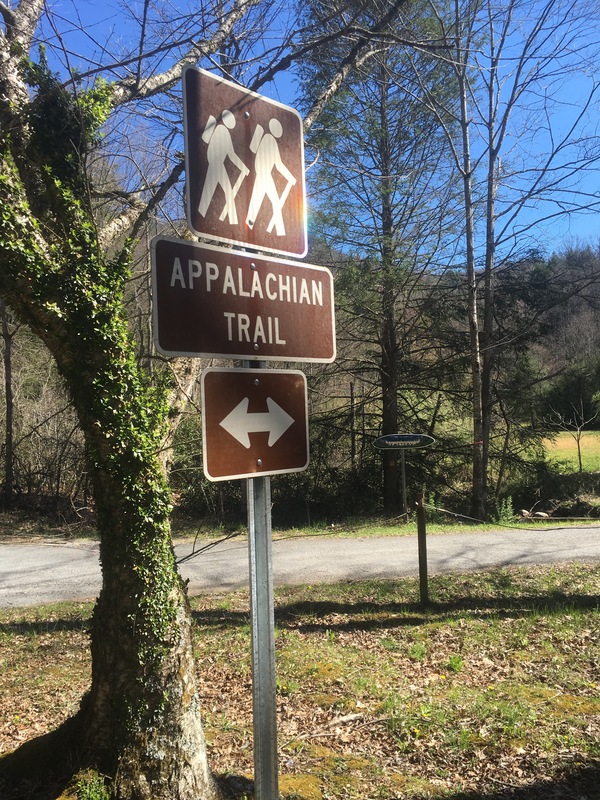 And all those miles and mountains come with a deadline for the northbound thru-hiker: October 15, when the northern terminus closes for the season. With that timeframe constantly in mind, it can be easy to get caught up in a “hurried” mindset. I certainly did not start out on the AT to set any speed records (and for those who are curious, the all-time record is 46 days, 8 hours, and 7 minutes). 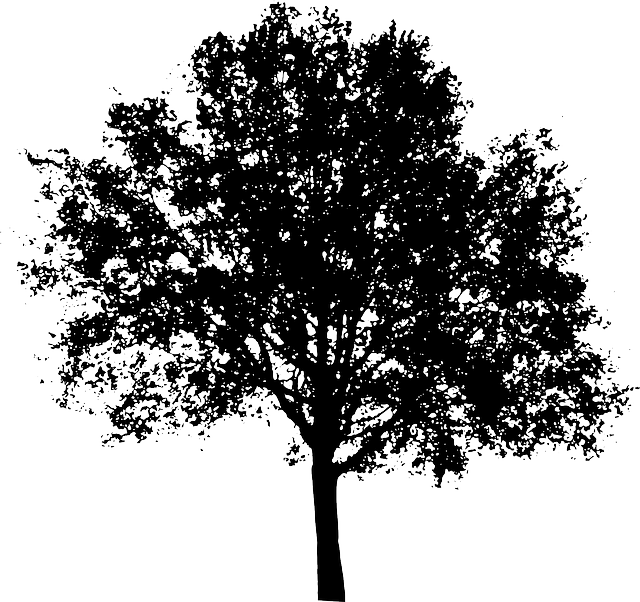 In fact, I was looking forward to the respite the trail offered from adhering to a rigid daily schedule that predominated my life for the last ten years. Yet, I began to find myself feeling rushed, as I felt the need to try to keep up with other hikers and push for higher mileage days to somehow prove myself. I had yearned for so long to divorce myself from the performance-based mentality I had adopted throughout my academic, athletic, and professional career, and here I had slid right back into it again. This eagerness to “get ahead” has already led to some missed opportunities. 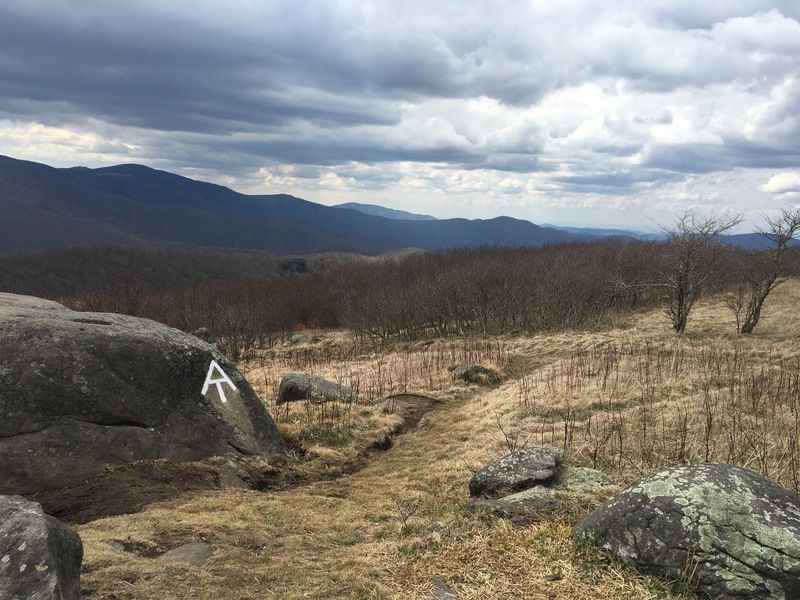 The Appalachian Trail is well marked by “white blazes” – rectangles of white paint that are applied to trees or other landmarks to help keep hikers on the straight and narrow way. However, there are numerous trails that intersect the AT and lead to other points of interest; often these are denoted by blue blazes. One day while hiking in the Smokies, I was hiking with two of my buddies I met on the trail. They often travel at a swift pace, but I was determined to keep up. I kept my head down, focusing on nothing but their feet in front of me and making sure I didn’t get too far behind. I missed a lot of the scenery that day, but even worse is the fact that I missed a short side trail to a beautiful cliff. That small diversion would not have significantly lengthened my hike that day, but at the time I thought I “couldn’t afford” to go. While enjoying our brunch, we ran into some fellow thru-hikers who had camped nearby at “Dismal Falls”, a waterfall that, despite its name, is actually quite lovely. They strongly encouraged us to stop by and relax for a bit. I was leery of going there, especially after spending a significant amount of time at the country store, and also because it was another 0.3 miles off the trail. But I then remembered how I felt several weeks earlier when I realized I missed the cliff in the Smokies. I somewhat reluctantly decided to go with the others, telling myself I would just take a look at the falls and then be on my merry way. I was so glad I went. 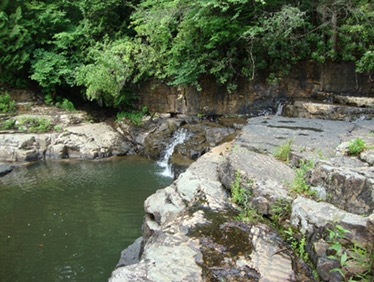 Not only were the falls beautiful, but it gave me the chance to catch up with other hikers I hadn’t seen in awhile, and I also took the opportunity to take a refreshing dip in the cool water as the day began to heat up! Thanks to the good food and refreshing swim, the next seven miles seemed to fly by. Suddenly, I found myself in a clearing with a large pond in the center. As it was not listed in my guidebook, I was surprised by its presence, but at the same time intrigued by the calm waters. Like a Labrador retriever, I truly longed to jump in. I stood there for a few minutes, staring intently into the water, toying with the idea of a second swim; but I was worried I wouldn’t be able to complete the 25 miles at a decent hour if I took another recess. Just when I had about made up my mind to move on, another thru-hiker I had gotten to know over the past several weeks arrived and, through the interesting phenomenon of peer pressure, we convinced each other to jump in. The temperature was perfect, and the leisurely swim did wonders to relax my stiffening muscles after the 15 miles I had just hiked. Soon, other friends joined us, and we had a good time relaxing by the pond. I began to think that I could not only go 25 miles, but I may even be able to go further, finally accomplishing a 30 miler. After drying off from my latest dip, I went on my way, aiming for the next shelter in 10 miles where we originally planned to stop and then deciding whether to push on from there. I continued to feel great up until the last two miles, when the rocks and long hours on my feet began to take their toll. As I limped into the shelter, I was certain I would not be able to go on. It was beginning to get late and my feet ached; besides, this was the plan to stop at 25 miles – I couldn’t deviate from the plan! Just then, one of my hiking buddies, Monster, came into the shelter. Monster is a ridiculously fast hiker and able to sustain his pace over long distances and often leaves me in a cloud of dust as he passes me by. Knowing that I wanted to try to break the 30 mile barrier, he encouraged me to go on, offering to hike with me the last 6 miles. Soon other hikers arrived and, again, the marvelous phenomenon of peer pressure had me convinced to go for it. After eating dinner and refilling my water, we were off. To my amazement, the miles went by easily, as talking with Monster proved a highly effective distraction. As we approached our goal, we were rewarded with some great views of the towns and farms below as the dusk settled in the valleys. When we finally made it, Monster and two other hikers who came behind us were the first to congratulate me on my first 30-mile day. Not only did I feel accomplished for covering the distance, but I had learned how important it is to be flexible when on the trail. Had I been so rigid in following the original plan, not only would I have missed the opportunities I enjoyed throughout the day, but I also would have never pushed myself to go further and break through the psychological limit I had. Having a general plan and idea of what you want to accomplish is important and can be vital in achieving long term goals, but life may throw other opportunities and challenges your way. Some may appear to detract from your goal, and others may seem too lofty, but keeping an open mind and being willing to alter your original plans if necessary may reveal possibilities even better than what you had initially planned. And now, my friends, I must continue my hike through the great state of Virginia. With over a quarter of the AT behind me, I am eager to see what yet lies ahead!